Which hiking trail in North Georgia is your favorite to visit? 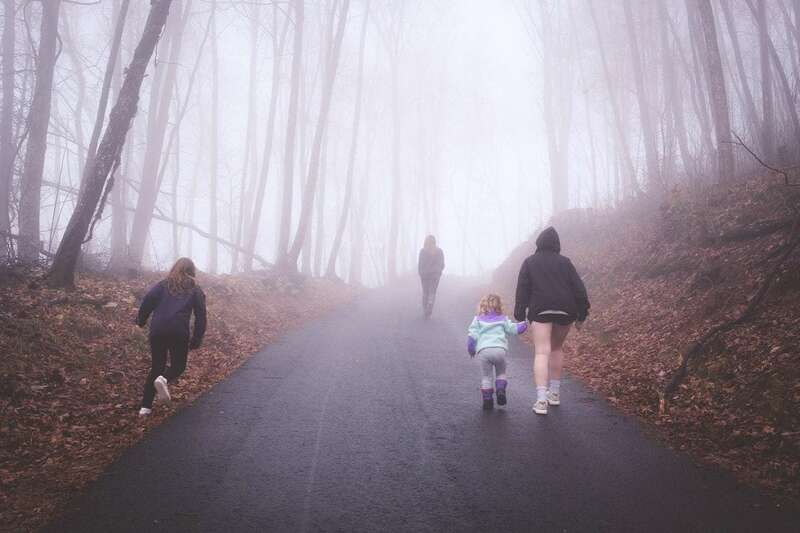 Spring is here and what better way to stretch and grow than getting outdoors with your family, like go hiking in North Georgia? If you’re anything like me, winter is simply way too long so at the first sign of warmer weather? We are all itching to get outside again; myself especially. 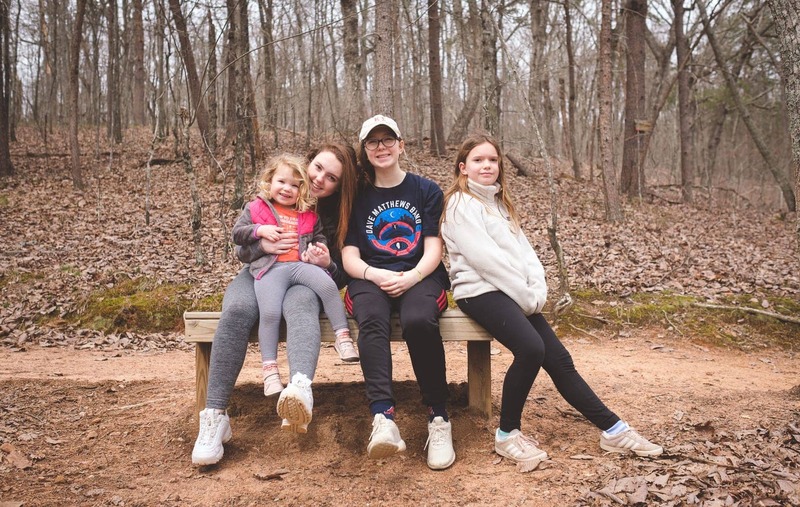 Hiking is something we love to do as a family and I wanted to share with you our most favorite hikes north of Atlanta. Keep in mind, my girls range in age from three to sixteen so these trails can accommodate kids of all ages. Some are even stroller friendly! We also have two English labradors who love going along, so I’ve noted whether or not these trails are dog-friendly as well. I’ll also fill you in on the best spots to eat after you’ve worked up an appetite. This trail is a very easy one with many switchbacks making it relatively flat. It’s often referred to as Indian Seats because of the two side by side rock formations at the top which look like seats. Along the wide trail you’ll see an abandoned gold mine entrance! (Don’t worry, it’s gated off) There is also a fairy trail at the base and an observation deck once you reach the summit. Keep in mind, Indian Seats is a fairly popular trail; however, it has great views, wildflowers and a wide path. A few things to remember about this one? It’s not stroller friendly. 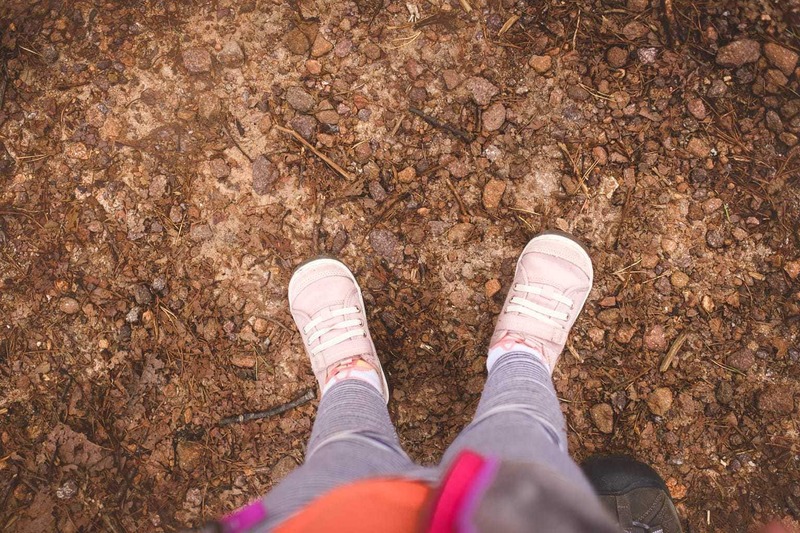 The park also has a very strict no dogs allowed rule, but is such an easy walk that your everyday sneakers will do the trick even though it isn’t a paved trail. Oh, this one is a favorite! Technically, I guess you can’t call this one a “trail”; however, I couldn’t leave this one out. The views and graffiti art simply can’t be beaten. Bell Mountain offers 360-degree views of Lake Chatuge in Hiawassee. Some days? The weather gives you fog just over the lake. Other days? You’re right next to the clouds and bluebird skies. Here you drive nearly the entire way up the mountain and park in the lot. Please note that the road is unmarked, very steep and gets more narrow as you drive up. It may seem like you’re not in the right place, just keep driving up! There is a parking lot with limited parking and from there you make the short, but pretty steep climb to the summit. The path is paved and there are stairs to an even higher observation deck. Bell Mountain is dog-friendly but could be tricky for toddlers if they want to climb on the rocks. 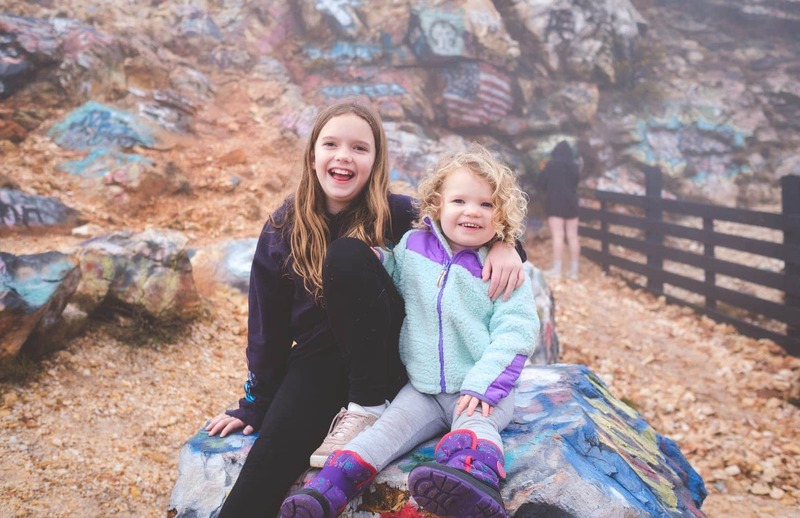 The bigger kids always enjoy climbing the graffiti-filled boulders to the tip top of the mountain. Imagine the view of the lake and the town of Hiwassee! Although you could sit on a blanket and picnic by the boulders, it would be a task trying to get all of your things up the steep hill from the car. There aren’t any tables to sit at either. Instead, I’d hit up The Happy Hawg BBQ which certainly the best local BBQ place and less than 2 miles away. This trail has several entrance points in Fulton and Forsyth counties; however, we like the Fowler Park location for a couple of reasons. There is ample parking, a skate park, open fields, a large playground and clean bathrooms right at the trail entrance. This trail is paved and includes both concrete and boardwalk areas. It’s nearly all flat except for the bridges going over the creek. Speaking of the creek, it makes for great wildlife spotting! 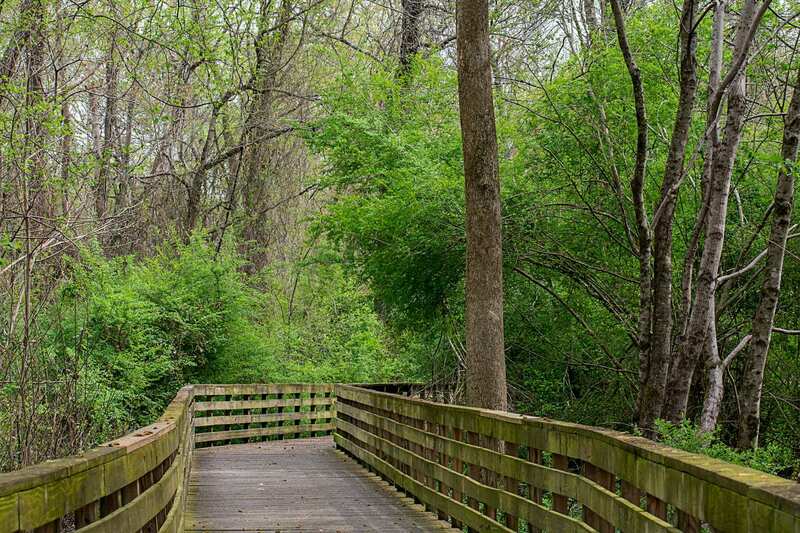 Big Creek Greenway offers both wetland areas and wooded spaces so children can find many different animals and hear loads of frogs. This trail is popular with cyclists and runners as well. Stroller and dog-friendly is also a plus for this fun spot. The Fowler Park location is just a short drive to The Collection at Forsyth where you’ll find restaurants like, Chick-fil-A, Red Robin and Mellow Mushroom. Or, grab a picnic and have lunch at the park at the many picnic tables provided. Once you make the one mile walk on this trail? You’ll see the highest waterfall in Georgia. 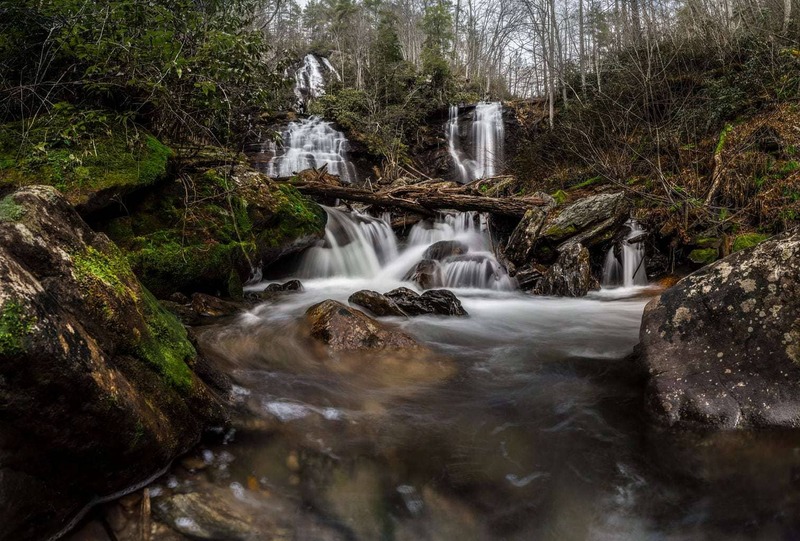 The 729 foot falls has a Cherokee name meaning “tumbling waters”. It’s certainly one to see! 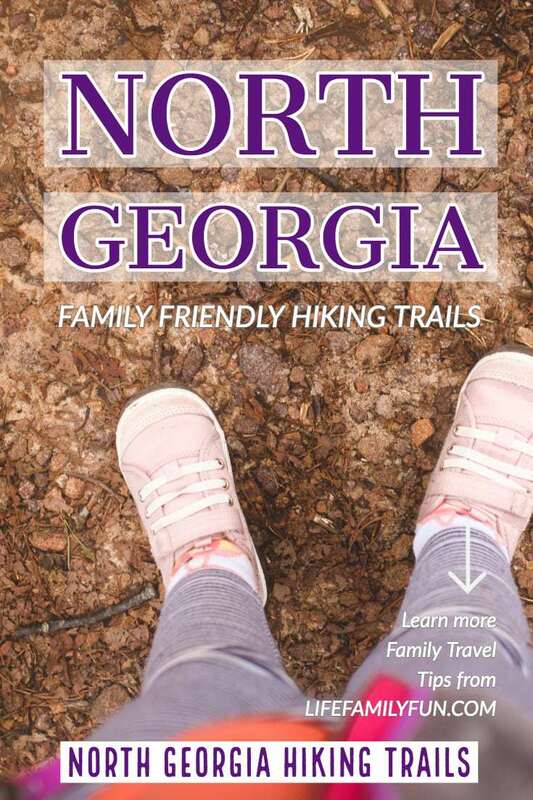 This north Georgia trail has two ways up: the wooded trail is slightly steep, but has many places to rest and is dog and toddler-friendly. The optional path is a stairway of 604 steps but would be slow-going for younger kids and pets. The route we always take is the wooded trail, cross over and down a few sets of stairs to see the falls up close and take photos. Then, back to the wooded trail to make the trek down. There’s also a restaurant up top inside the lodge with gorgeous views and cold drinks. You may need those on a hot summer day. We love this trail and it’s a must-see, no doubt! Something to keep in mind for all of Georgia’s state parks, there is a parking fee (usually $5), but if you have a public library card you can “check out” a state park/historic sites pass. Much like checking out a book. And also remember…STAIRS! We usually eat at the Amicalola Falls Lodge Restaurant which is up top and has beautiful views of the park. There’s a large deck where the little ones can let loose a bit. Another option is to picnic near the stream as there are loads of spots along the trail, the base and up top. 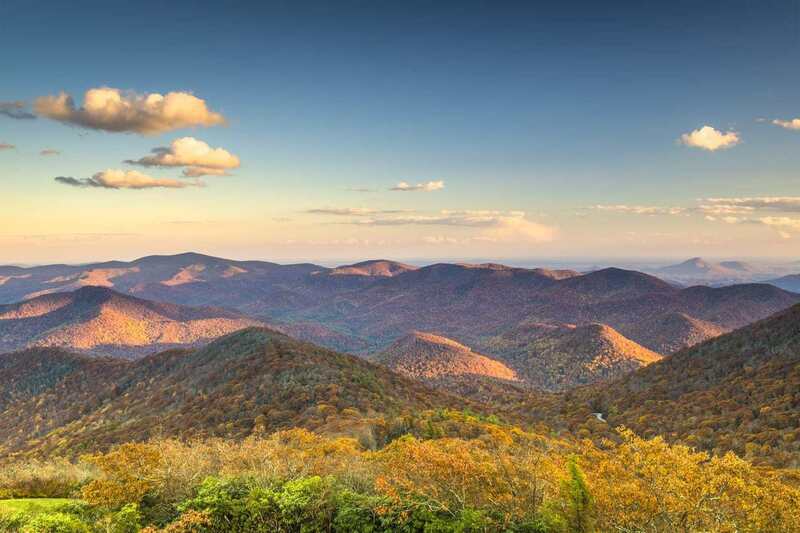 From Georgia’s highest waterfall to Georgia’s highest peak, Brasstown Bald is another must-see. You will need to pay for parking, but again, you can also “check out” a park/historic sites pass at your local public library that will exempt you from the parking fee. This is another paved trail that is stroller, kid and dog-friendly. The trail is relatively short, but rather steep and has several switchbacks. I tell you all about our first trip to this steep spot in this blog post. Along the path are many places to stop and rest. Once you make it to the summit, you’ll be surrounded by 360 views of north Georgia. The viewing platform is large and wide, offering many places to take in the views of the rolling mountains. There’s also a really great museum below the observation deck (my children loved it!). Keep an eye out for the elevation marker that’s just under the stairs to the observation deck. Ask the park ranger for help locating it. If you’d rather not walk back down, there’s a shuttle you can take and will accommodate strollers if you have one. This is another favorite of our family. The trail through the mossy woodlands is just beautiful. It’s also a great place to catch a sunrise or sunset! The town of Blairsville is right nearby and The Sawmill Place is extra yummy! From sawmill gravy to hamburgers this little restaurant is a great choice. They also have a little store inside. Or, you can always pack a picnic and eat at the base of Brasstown Bald. 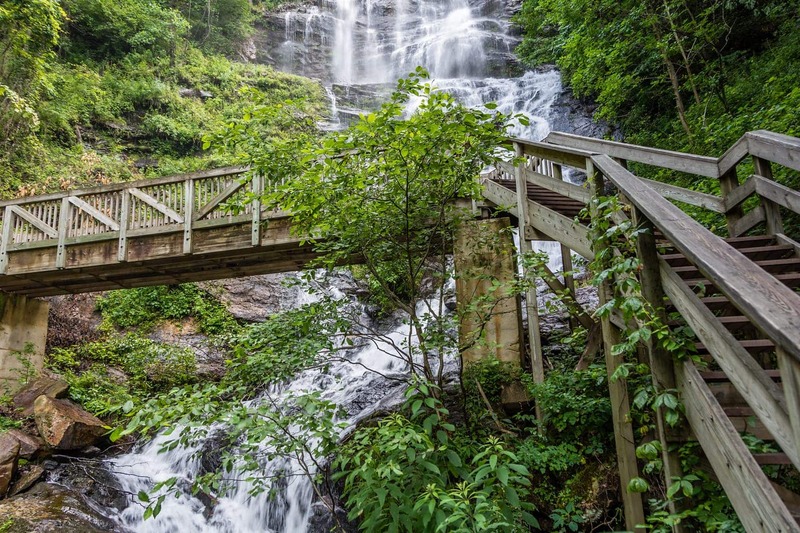 Anna Ruby Falls is a short walk on a paved trail. It’s dog-friendly as well as stroller friendly. This one is a perfect choice for any season, but is a little steep in places. Again, it’s paved so that makes it a bit easier. As you’re walking up, you’ll get peeks of the double waterfalls through the trees. There are boulders all through the forest on the way up and the reward at the summit is a gorgeous tandem waterfall surprise. This trail is convenient to downtown Helen and also Unicoi State Park (which is another great stop!) Anna Ruby Falls is a popular must-see spot in North Georgia as it’s an easy trail with a great reward at the end. You won’t want to miss this one! My suggestion is to stop by Betty’s Country Store which is about four miles from Anna Ruby Falls. You could grab something from their deli and eat on the front porch, or take it with you to enjoy at the falls. If there was ever a kid-friendly trail that has everything there is to offer? Sweetwater Creek State Park is the one. There are several trails within the park (again, pay to park or use your park pass from the local library) and all are dog-friendly. 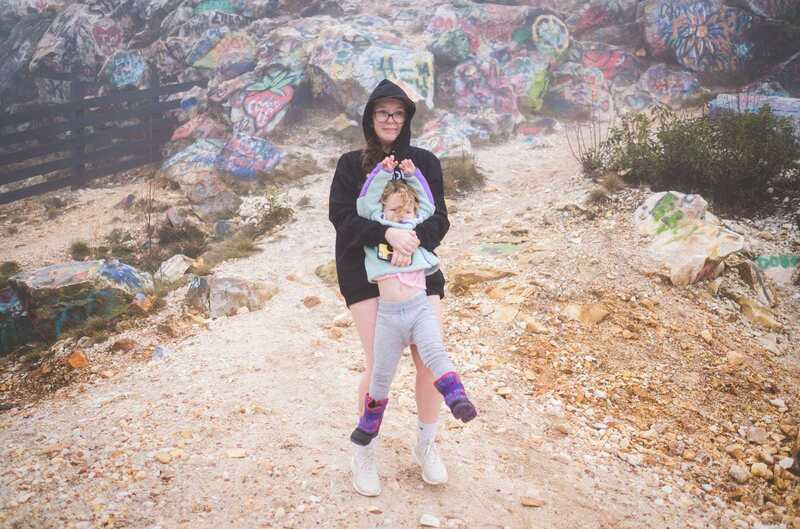 These trails aren’t stroller friendly, but are an easy walk for any hiker. 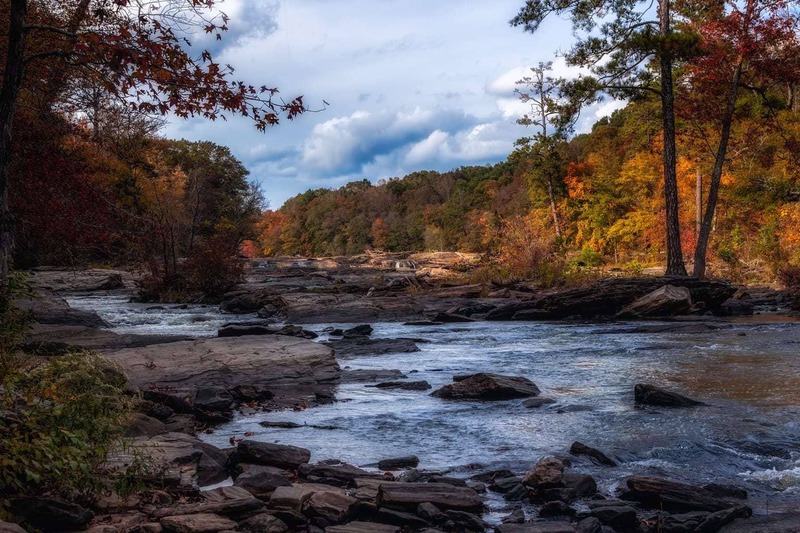 You can walk the various trails alongside the quickly moving Sweetwater Creek and see Civil War ruins along the way. 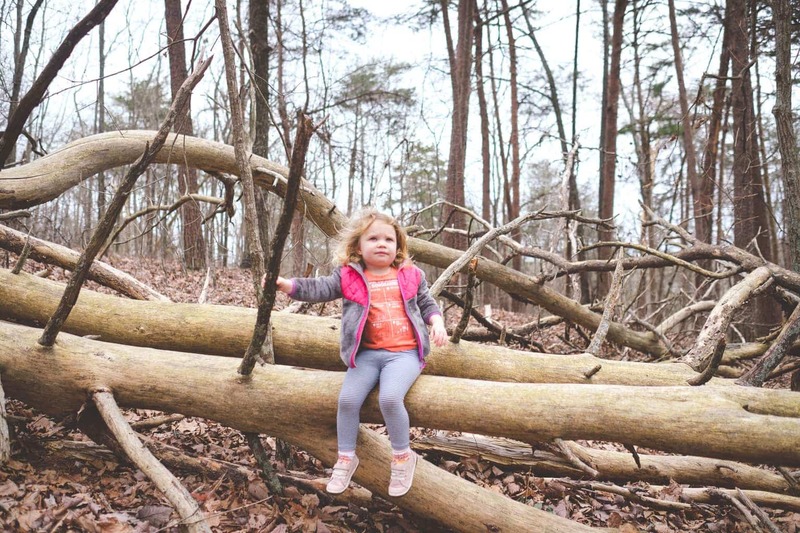 This easy to navigate park has forests, wildflower fields and creek shore. The shortest trail (red trail) is two miles and leads to the ruins. The longest trail is just under five miles (orange trail) and is the newest trail in the park. The orange trail may be the longest, but it leads to lovely views of the Atlanta skyline. One bonus to this park is getting to explore the large cave that was used by Native Americans. This park has 2500 acres of well-maintained trails, forest and open meadows. It is certainly worth a visit. Less than three miles away is the delicious and laid back Beaver Creek BBQ. Just keep in mind that they close at three o’clock on Saturdays. If that isn’t interesting to you, there are loads of spots less than three miles away; including chain restaurants like Chick-fil-A and Cracker Barrel. Again, a picnic is always an option and there are gorgeous spots all around Sweetwater Creek so take a blanket along and enjoy the meadows. 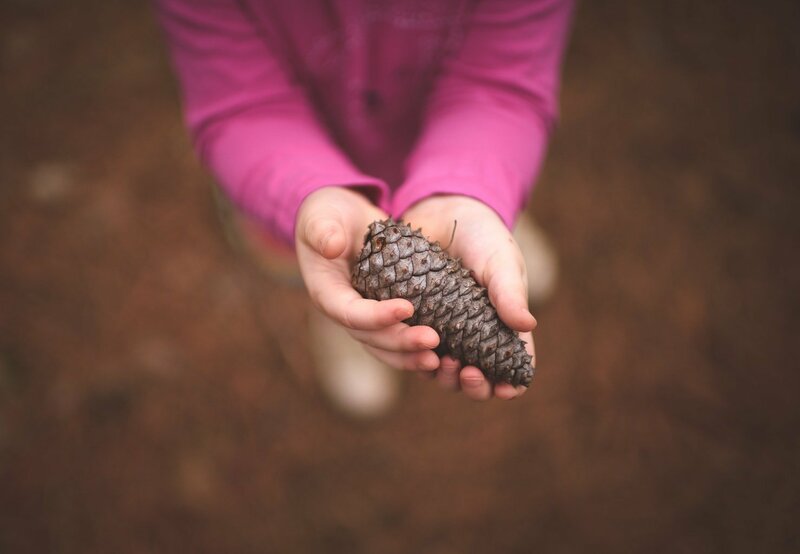 Photographer + SAHM to four girls from toddler to teen, Melissa Gibson loves enjoying the great outdoors of North Georgia with her family and pups. She has been featured in Click magazine, ClickinMoms blog, and Click it up a Notch. 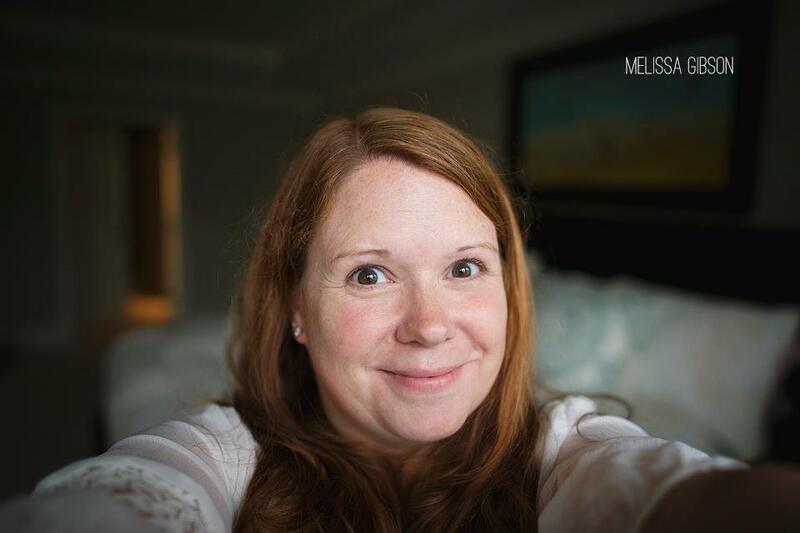 Follow Melissa at www.freckledmommy.com and on Facebook or Instagram. 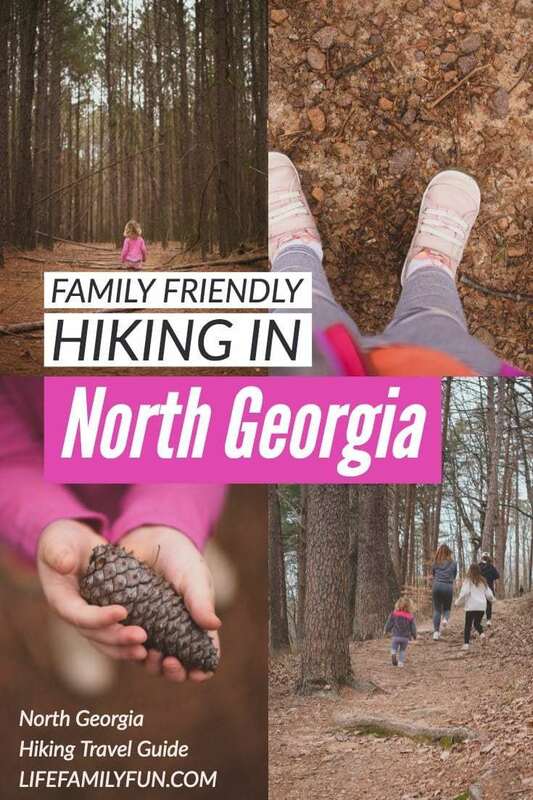 Spring is here and what better way to stretch and grow than getting outdoors with your family, like go hiking in North Georgia?